Waterproofing roofs is perhaps the most important factor when it comes to roof construction. It is vital that roofs are correctly waterproofed, especially when they are “flat”. Roofs must be durable and must not allow the penetration of rainwater or any other surface water to its interior. Roofs must not allow the accumulation of any water on its surface. But the legislation simply lays down the basics. For additional guidance, anyone building needs to refer to the South African National Standard that explains how the law can be successfully applied. Drainage and waterproofing of flat roofs. The SANS elaborates on the legislation stating that roofs must be able to resist penetration of rain to the extent that water in category 1 buildings (see below) any water that penetrates the roof won’t run down the inside face of walls onto the floor, or form damp patches on the ceiling or the floor. In terms of all other buildings (i.e. those that are not category 1), if water penetrates the roof it won’t be intense enough to run down the inside surface of the roof or drip onto the floor or ceiling. The SANS also state that roof coverings and waterproofing systems must be capable of being repaired if damaged, even if the materials are old. All products that are used for roof coverings and waterproofing systems must have a lifespan of at least 10 years. If the structure or system is particularly intricate, making it difficult to replace, then the expectation is that materials used should have a lifespan of at least 20 years. So what is a category 1 building? Part A: Administration of SANS 10400 classifies all buildings in terms of occupancy (which in terms of the law means “the particular use or the type of use to which a building or portion thereof is normally put or intended to be put”. H4 – dwelling houses where there is just one dwelling unit (or house) on the site, and possibly also a garage and domestic outbuildings. This is, of course, your most common “home”. A category 1 building also has no basements, a floor area that is no larger than 80 square metres, and a maximum length of 6 m between intersecting walls or members that provide lateral support. So you will see that there are quite a lot of South African homes that don’t fall into the 1 category. If metal roof tiles are used on an existing roof of this category, the existing slope may be retained. But is is important to be aware that if there are strong gusts of wind, the suction force on the roof tiles might exceed the mass of the tiles. If the tiles are securely fixed it will usually prevent them from being lifted. But a much better option is to include an underlay membrane under the slates or tiles. This will reduce the risk of wind uplift because it can lower these pressures substantially. NOTE: SANS 10062 contains fixing instructions for the fixing of different types of roofing. This national standard is available from the SABS. The pitch indicated in Tables 1 and 2 are minimums. In addition to these, sheeted roofs in category 1 buildings that don’t have hips and valleys, may have a slope of 5 degrees, as long as all the end laps are sealed and have a lap of at least 250 mm. The slope of any valleys in the roof should then be no less than 11 degrees. If tiles are laid at a pitch of 30 degrees they must (in terms of the SANS) be tested in a rig as specified in SANS 542. The relative humidity must be maintained at a minimum of 70% during the test, and droplets should not form on the underside of the roof. 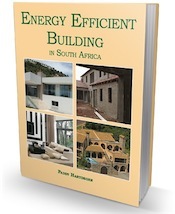 It is a little different for category 1 buildings – rather than droplets forming (or rather not forming) – the test must show that water doesn’t flow down the inside of the tiles. In other words the roof MUST be waterproof! Sheeted roofs should be tested in accordance with ASTM E 1646 to check that they don’t leak. There must be no dripping of water onto the ceiling or floor of category 1 buildings. All tiled and sheeted roof coverings must be installed in accordance with the manufacturer’s instructions and/or by workers with the correct skills. Thatched roofs should be installed according to SANS 10407. 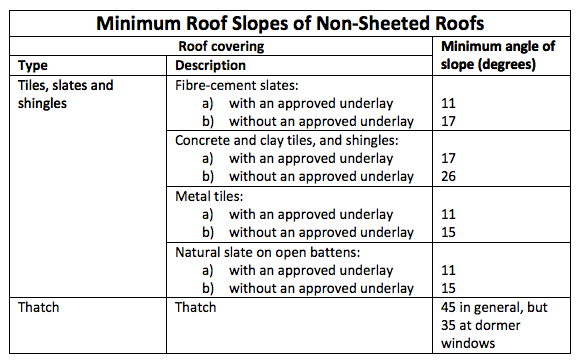 The required thickness of the thatch is shown in Table 3 (above). All roofs with a pitch less than 26 degrees or more than 45 degrees, and all roofs in coastal areas (to a distance of 30 km from the sea) should have an undertile membrane that is loose-laid so that water can drain between the rafters. If an undertile membrane is properly laid it will provide a very effective, impermeable barrier against wind-driven rain and dust. For this reason the SANS states that underlays should be provided for all slate and tiled roofs, no matter what the pitch (or slope), and where ceilings are not installed. The manufacturers’ instructions must be followed carefully for tiles, slates and shingles. A well designed, waterproof roof light. Roof lights have become increasingly popular over the past few decades; but if they are not properly designed and installed, they can leak. The SANS for roofs state that any roof lights may have an opening of no more than 0.6 square metres. If it is the type that incorporates a translucent roof sheet, it may be 700 mm wide. In addition, roof lights must be able to resist UV degradation for at least 15 years, and hail (at any time) of 10 J (in accordance with SANS 10400-B). Lastly, all roof lights must be designed and installed in a way that rain will not penetrate the roof. Flat roofs can be extremely difficult to waterproof, which is why all so-called “flat” roofs should be built with a fall of 1:80. This might require a steeper design slope of 1:50 in concrete slabs where construction is not always 100% accurate. A 1:50 slope is also required where there is an interruption in the flow of water on the roof. It is very important that precast panels and precast roof structures are designed in a way that if there is subsequent movement of the concrete elements, this will not damage the waterproofing system or compromise its performance. The SANS has a really useful drawing that shows how construction drawings should clearly designate ridges and valleys, and indicate the relative fall – or slope. Gutters and downpipes are not mandatory. However, unless gutters are designed by a competent person, they may only be located on the “perimeter” of the building. They should also be designed to ensure that stormwater doesn’t penetrate the inside of any building if they become blocked at any stage. Outlets must be set flush with concrete. If there is timber decking they must be recessed so that there isn’t any ponding around the outlets. Any outlets should be at least 500 mm from upstand elements including parapet walls, and they should be at least one metre from any expansion joints. Intallation requirements of manufacturers and suppliers of rainwater goods absolutely must be adhered to. Any concrete roof design should take the thermal properties of concrete into account. This will be determined by a concrete technologist or other competent person, who will determine the required thickness of the concrete and its density, and design the roof in such a way that a waterproofing layer is built up. 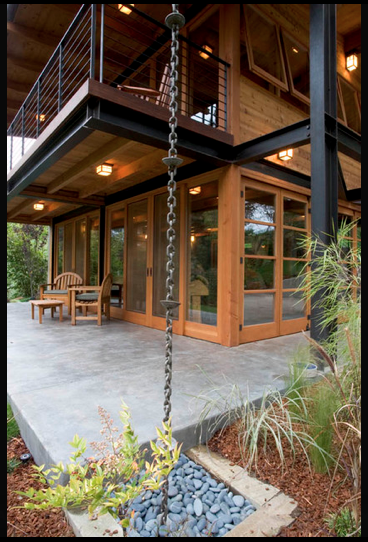 Often the designer will incorporate a “thermally insulating layer” above the structural concrete deck. When this is done it is important that attention is given to ventilation so that any moist air that might accumulate below the waterproofing layer is vented to the outside. The concrete used for flat roofs shouldn’t contain more than 7% moisture by weight; and sand-cement or lightweight screeds shouldn’t contain more than 10% moisture by weight. If expansion joints to accommodate the flow of water are not custom-designed by a competent person, “twin kern upstand-type joints” should be installed over any expansion joints. These should be positioned away from any outlets, and should be built in accordance with the illustration given in SANS 10400-L. Upstand beams that are at least 170 mm high should be incorporated where masonry walls meet the concrete surface of the roof. At these “intersections” (i.e. where they join) corner fillets measuring at least 75 mm (vertically and horizontally) should be build in. There is another drawing in the SANS that shows how this should be done. Another drawing shows how drips should be incorporated under all overhangs of concrete roofs. In addition to these design elements, all concrete and screened roof surfaces must be waterproofed and constructed to the correct falls and cross falls (see first paragraph under Drainage and Waterproofing of Flat Roofs above and the relevant section in the SANS). It is vital that there are no undulations in the concrete surface, and nothing should be allowed to protrude into the concrete or contaminate it. The recommended finish for concrete roofs is wood floating. While the final surface should be sound and smooth, concrete and screened surfaces should not be highly polished. So they should NOT be power floated. It is important to realize that waterproofing systems can delaminate if the substrates don’t allow any moisture vapor that has been trapped to escape. Generally a sand-cement screed that is not very dense will allow retained moisture vapor to dissipate and therefore protect against the possibility of delamination. SANS 10400-L suggests that a 20 mm screed is laid over all “lightweight” screeds, because these are generally too friable and porous to provide good adhesion for waterproofing systems. The SANS also suggests that concrete and screened roof surfaces be allowed to dry thoroughly before any type of waterproofing system is applied. Where waterproofing turnups are provided against brickwork and other masonry walls, they should be counter-flashed if they are not linked to the stepped damp-proof courses in cavity walls. The same membrane should be used, and the flashing should be cut into walls to a depth of at least 40 mm. Generally sand-cement coves with a radius of at least 45 mm should be formed at all the inside corners of both vertical and horizontal surfaces – unless a particular waterproofing system has a different design and doesn’t require this. Where there is a timber deck, 38 mm timber fillets may be fixed at all the junctions of horizontal and vertical surfaces. There is always a potential problem with outlets. The installer must therefore pay close attention to overflow pipes, flues and so on, and make sure that the waterproofing material used covers everything but the opening. Generally waterproofing membranes around any pipe work should be clamped with a hose clamp or something similar, before flashing is applied over the pipe. If outlets aren’t the “full-bore”, coned type, pipes should be flanged so that waterproofing can be done correctly. Elements such as water storage tanks and solar absorbers should never be allowed to penetrate the waterproof layer. All external corners and edges to be waterproofed should be rounded, and the height of all DPCs should be at the same level as the waterproofing turnups. In addition to this part of SANS 10400, SANS 10021 also provides some information and guidance about the waterproofing of roofs. Remember, it’s important to do it correctly! Just bought a town house and moved in beginning of June 2016. The place was build in 2013 but the roof is leaking. I was told by a friend that the water proofing must have a 5 years guarantee and I have just read above the requirement of the SANS 10400-L and it states that the “Roofs to be up to standard, they must remain water tight for at least five years”. Does this mean I can request the developer to correct the leaking roof? Since you are not the original owner, any guarantee will not be in your name – though it should be transferable. The other question is whether the builder was compliant and gave a guarantee of any kind. Whoever built the town house should have been a member of the NHBRC and the dwelling should have been enrolled with the NHBRC. This would give you access to the standard NHBRC warranty. But as you quite rightly say, the NBR require the roof to remain water tight for at least five years … so clearly the developer/builder is liable. I bought my house in 2012 and my roof is leaking now in 2016. When the bank sent their assessor out they said my roof pitch is to flat on my patio and I need to get an engineer to give me a certificate and I must fix the roof my self. My question is how did my bond get approved originally but now when there is a problem they say it is for me to fix. What can I do has they now say even if I want to increase my bond I can not until a engineer approves my roof. Please help I don’t know what to do. What is the cost of an engineer. Unfortunately the reality is that banks don’t generally do proper checks before they approve bonds! You will have to find an engineer and see what he or she charges. I have no idea. Our house is an old one ( built in the 60’s when they still built them properly!!) and in November 2015 a massive hail storm blocked two valleys and as a result, the roof leaked. I have since been told that since the roof has no underlay, it will not be covered by insurance. Its the first time its ever leaked, so we had no idea that there was no underlay. The pitch of the roof is quite steep, definitely steeper than most rooves – my husband is 6 ft and he can walk in the ceiling with clearance. Aside from that though, should we now investigate underlay as well as redoing the valleys and ridges? We were going to “waterproof” the whole roof without underlay but do we now need to underlay as well?? Really not looking forward to the added expense if its not necessary! Not all roofs require underlay. Check this section to see if you can ascertain whether your roof does – partly to do with the pitch. I can’t find the reference, but I think there is something about underlay being required at the coast. I might be wrong. However if yours is an old house, I would argue that unless the insurance policy specified that there must be underlay or that the roof must comply with the new NBR, then they need to cover the damage. Just wondering if anyone can help. I have paid a builder R140 000 to build me one room added onto my house. The room has got water running down the walls coming out of the floor and seeping through the back wall between the floor and the wall. He says that its not his problem he didnt not quote for waterproofing or drainage. Surely that is included when you build a rooom. If anyone can help, let me know. You should sue him … that is ludicrous! All building work must be done according to the NBR and this includes the need for DPC under floors and under walls.